I posted on trapper talk and was told to post here. I have a friend that is having problems with gophers chewing holes in the tape on his drip irrigation system. Tape is 18" deep. They have abandoned 20 acres so far. Subsurface irrigation cost $1700/ac on average. Thanks Getting There. I should have worded it a bit better. I’ve been trapping over 30 years, but don’t have any experience with gophers. Just looking for some pointers on trapping them or if they can be controlled on large swaths of land. 20-160 acres? Bigger area's require more traps. I think persistent is the key. We do not have gophers in Michigan. I know trap line products makes a trap and there is a trap names clinch (?) looks like it would work well. Being a trapper you have a good idea how traps work. There is a lot of good information on the internet. Yes, you can easily trap them out of acreage that size. This is the ONE animal that I have become pretty good at trapping. I have tried many methods but I will share what has worked for me. First, I had to find the right trap. I tried different kinds, but the Macabee style works best and is easiest. I would suggest getting 6-8 of them. You can get them at hardware or farm supply stores, got mine at TSC. There are you tube videos out there to show you how to set them. Forget about the videos and instructions that have you excavating soil to catch these critters. Keep it simple, takes a few minutes. Find the freshest hole, look for evidence of fresh dirt. The dirt will be in a fan shape, many times you can see a small round pile in the middle of the inside of the arc, this is the hole. If you can't see it, probe around with something. The tunnel will generally be in the direction opposite the fan shape of the mound. Use a hand held garden trowel/spade to dig the loose dirt out of the hole, keep digging until you feel it break through, you want it good and open. The gophers don't like air in their tunnel and will come try to plug it, setting off the trap. Make the hole big enough for your trap and shove it as far down as you can, I like to leave it just enough where I can still see the trip pan. Done. Don't cover the hole. I don't use bait, and I don't worry about human scent. 2. Knock down all the mounds near your traps so you know if a fresh one shows up. I have had them avoid the trap and dig a new hole. Just set the new hole and you'll get him. 3. You will have them bury your trap once in a while. No big deal just reset, still beats excavating new holes and covering like some instructions say. 4. Only set fresh holes. 5. I leave a little loose dirt in the bottom of the tunnel so when I set my trap I rub it back and forth so the trap is slightly bedded. Seems if they walk on dirt rather than the trap I have less trouble with burying. 6. Once the trap is in the hole, pull back on the trip pan to give it a "hair trigger", you will see what I mean when you set the trap. 7. Keep after them! 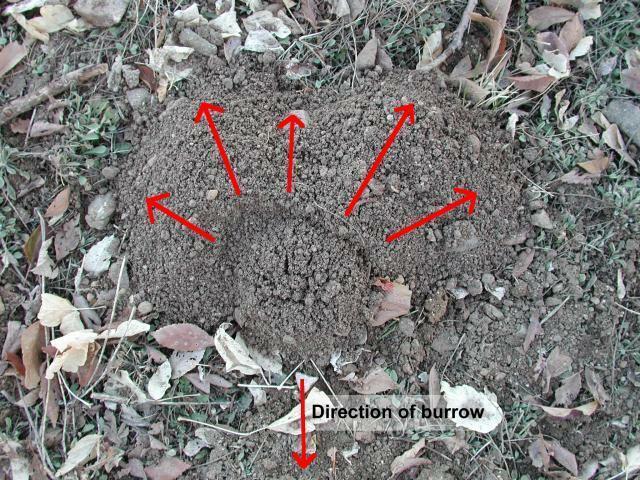 Watch for fresh mounds nearby, trap them out around the perimeter as they show up. If you are serious about trapping gophers long-term, I would strongly recommend you visit Steve Albano's Trapline Products website. IMHO and experience, his Gophinator Gopher trap is the only way to go. Secondly, I would search this forum's Archives for trapping tips/techniques offered. An easier alternative is to Google "trapping gophers, Trapperman Forum." You'll learn most of what you need to start trapping these critters and then some. There's plenty of good advice available here if you still have questions thereafter. Best of luck! "Happier than a gopher in wet sand." Thanks a million Grubbie and Aggie73 I appreciate your response. I’ll get after them. I have gone on Steve’s web site and left at least three voice mails in the last five months. Also sent at least three e-mails in the same time, he has not contacted me once. Is there a better way to go? The page sponsor to the ADC forum sells Albano's traps. They refer to them as the molenator sp?. I pick up 3 of Steve's traps last year and sorry to say, wasn't overly impressed with them. He has two sides and I got the large ones but they where too small for some gophers. There's no chain or means of securing them so used a heavy decoy line and promply lost one the second day. Line was cut and no sign of it being dug out by a something. Changed the line out to a wire and haven't lost any since. Don't get me wrong, Steve's builds a good trap but they need to be bigger and a chain or something to secure them. I would suggest starting out with some Death Clutch traps. They are very affordable at about $5.00 each. I've had better luck with them and millions of gophers have been caught by young and old alike. Just my 2 cents worth. Common sense is a not a vegetable that does well in everyone's garden. I really like the gophinators, I have both sizes in the mole traps and about seven dozen of the regular size of gopher traps. Have caught a lot of gophers with them, but last summer I was at auction and I purchased some gophinators that were larger than what is listed on his web site. The person told me he got them from Steve, but they are not listed. I would like to know where and how to purchase some. I have not purchased and trap from Steve in a long time. My mistake. I guess I better look at his web site. I have gone on Steve&#146;s web site and left at least three voice mails in the last five months. Also sent at least three e-mails in the same time, he has not contacted me once. Is there a better way to go? We use 3 different traps. The Death Klutch. The Cincher. The Lanesboro. 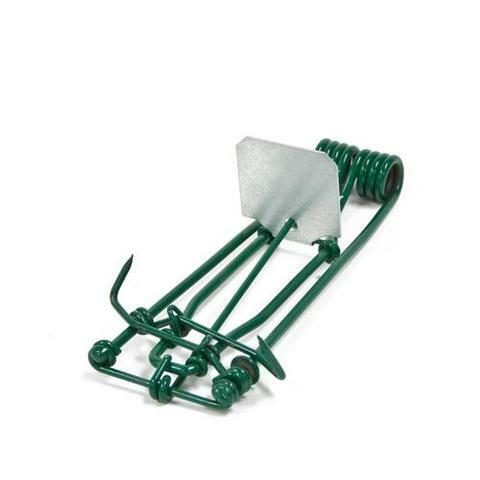 All quality traps and each has it place in different situations. I would recommend purchasing a couple of each and experiment with them. We also stake each trap each set with a rebar stake. We have experienced fox, coyotes, skunks, badgers and the family dog making off with trap and gopher. Some are recovered but most are not. If you are consistent in trapping the land you can stay in front of the gophers in just a few months.